What's up everyone? Chandler here to give an update on my Space Wolves. At the beginnning of the year, I said I wanted to get through all of my Space Wolves. Between Work, Life, and Warhammer, the painting has been on the back burner until the summer started. That is when I got to work on completing everything that I wanted to get to. The army is coming together as I completed a great deal of my wolves, but I still have a ways to go, and with Wolves dropping in the Next Month, this list is going to explode, and the Rout will be even Greater. 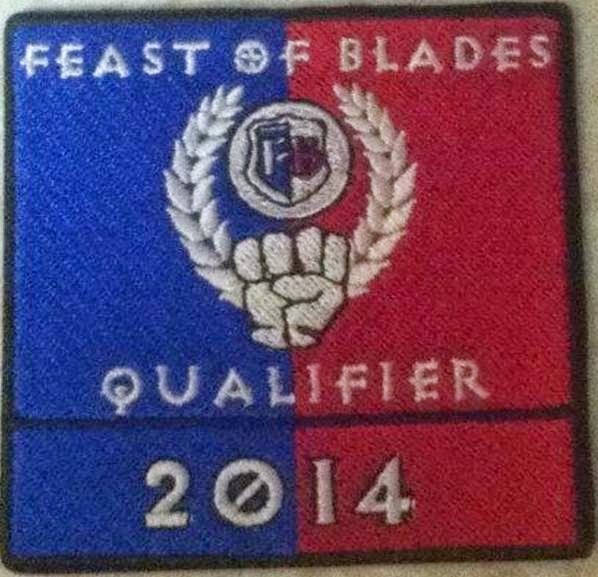 Feast of Blades Qualifier Results and Batrep. I wanted to take a minute to share the results of the Feast of Blades qualifier I played in at Universal Bits and Games in Sioux Falls,SD. Firstly, hats off to those folks for hosting the tourney and doing everything they can to get the hobby going in the area. There was a small turnout at the tourney (about 10 people or so) but the terrain and boards looked great, every army was completely painted, except mine which had one unpainted biovore (fail on my part I know!). I can sew this patch on my jean jacket! Chicks dig jean jackets! The tourney was three rounds Win/Loss with battle points and painting score as tie breakers. I am happy to say I was able to sweep the day and walk away with the win! I played against a Salamanders Space Marine player, Tau, and a Dark Angels player. I did not take enough pictures but I was able to salvage one battle report out of the whole deal. NOVA is swiftly approaching - I've put a countdown timer on the right of the blog. With a busy July, going has been slow for the most part, but I'm getting comfortable with my lists and the to-do list by the end of August. 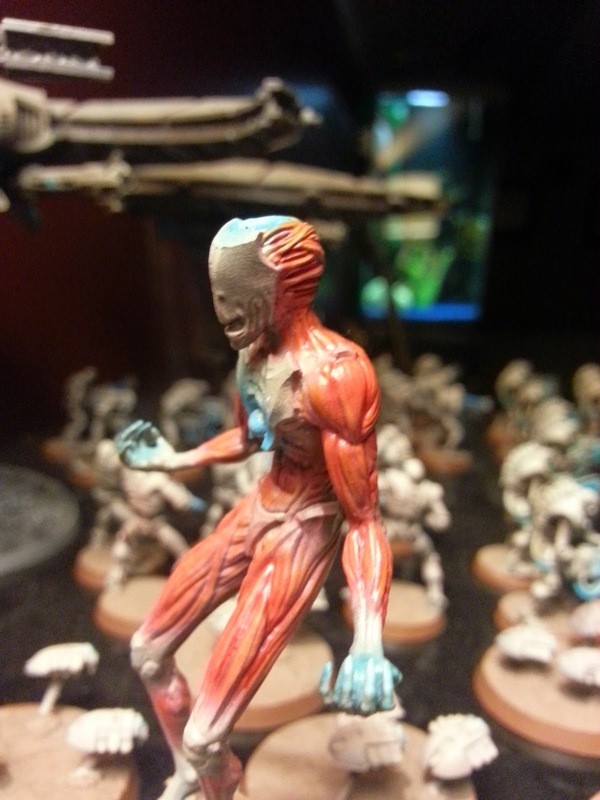 First on my list was my Transcendent C'Tan stand in from MasterCrafted Miniatures. It has been a long time, but I need to catch up with my Horus Heresy Review series. 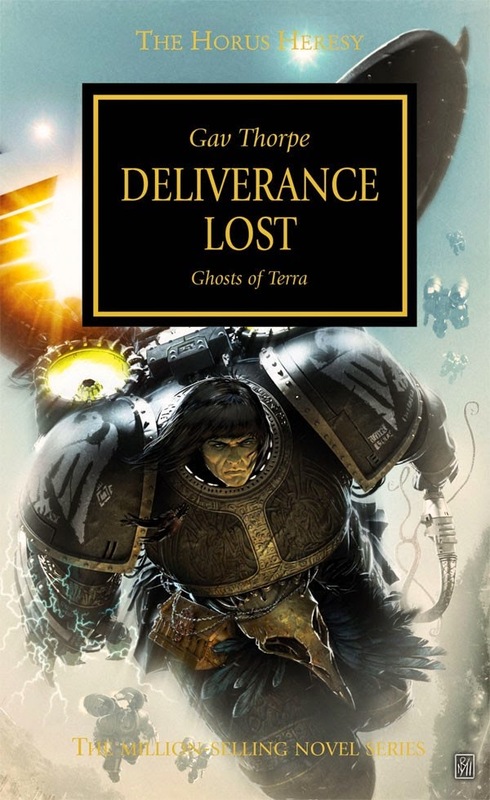 It has been a while since I read Deliverance Lost, but I liked it, in large part because it features two of my favorite Legions, Raven Guard and Alpha Legion. As always, spoiler alert for below the bump, though it might be fairly general. 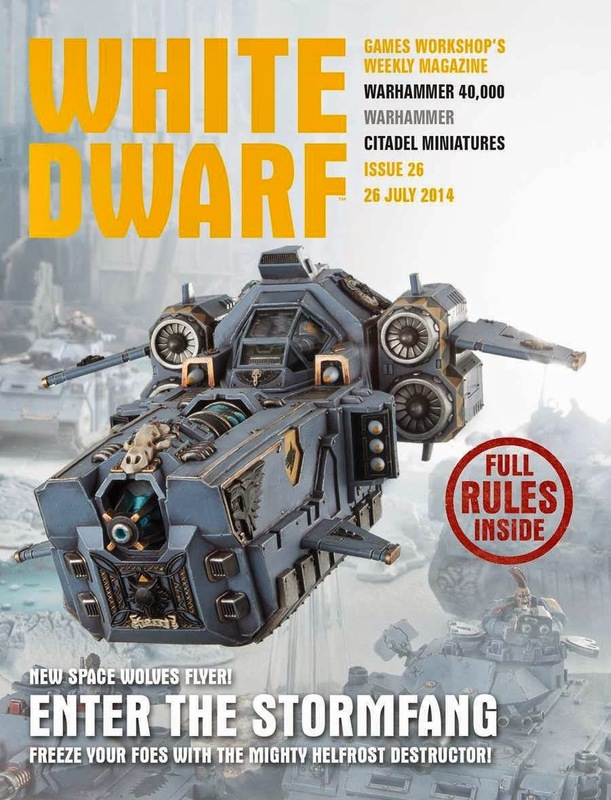 This week the Space Wolves get their flyers and the Sons of Russ take to the air in two very Wolfie Flyers. One is the Stormwolf and the other is the Stormfang. Both have unique qualities and abilities. We have a new book from the Black Library and dive into the Space Wolves and their chapter history. Just wanted to let you know my most recent article for Torrent of Fire is up. July has had less than half as many games as June, so I tried to look at June and July combined and how matchups now seem to be comparing to matchups through the end of 6th. I also looked at the overall change in Win Percentage for armies, and finally popularity. It seems like Eldar, Tau, and Daemons have seen less playtime than previously so far in 7th. Check out the full article. Hope you enjoy it. What's up everyone? This week on the podcast, The Full Crew is back and they are talking about everything 7th edition from the tournament side. We chat about upcoming Tournaments including Feast of Blades Qualifier, NOVA, and Renegade. 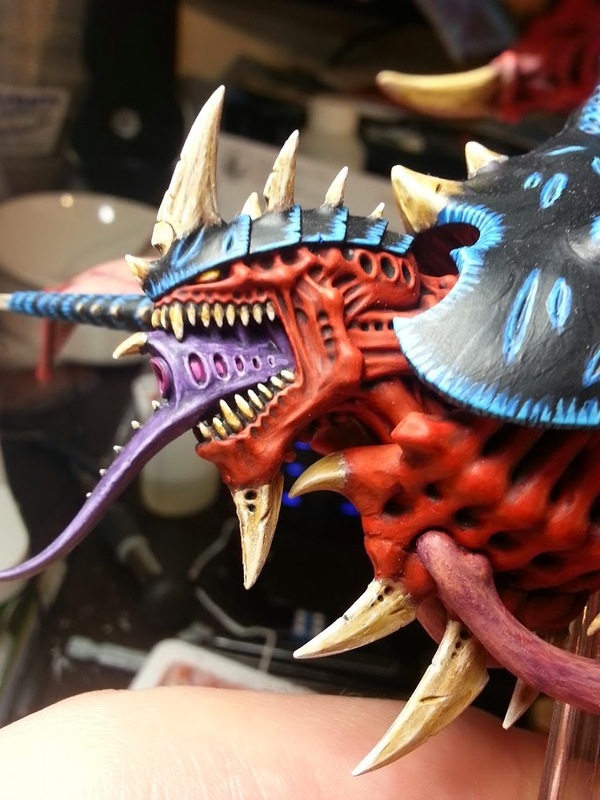 We chat about the lists we are looking to take, and we discuss a lot of possible lists and how to take them down using Tyrandis and Necrons. We also quickly talk about Missions and Vassal to get some "play testing" in. The Boys are back and prepping for some of the Next Big Tournaments. Tourney play and using your favorite suboptimal units. 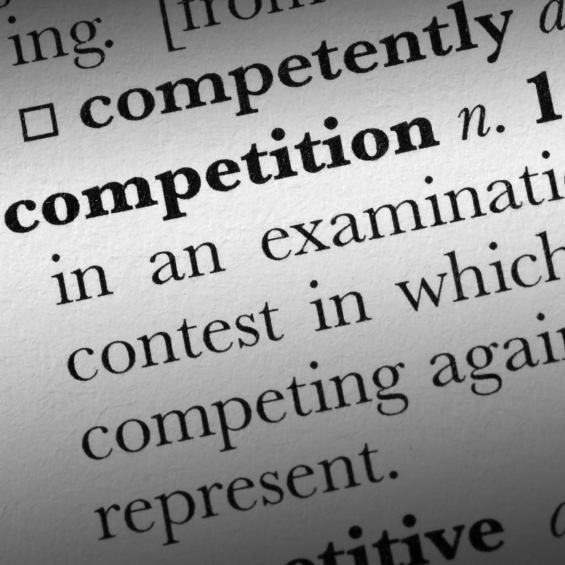 As I am putting the finishing touches on the 1500 point list for this weekend, I got to thinking about what it means to make that leap from completely casual player to someone who wants to do well in tournaments. I am in the midst of that leap now, so I want to talk about one of my initial observations. It's time to show off all I have(n't) done for NOVA this past week! NOVA is fast approaching, but I'm starting to see a glimmer of hope for finishing. I've decided that with the two exocrines and third flyrant, I'm going to get them to a 3 color standard first, then go back if I have time. That takes a lot of the pressure off, and insures that I can play with all of my models when I get there. 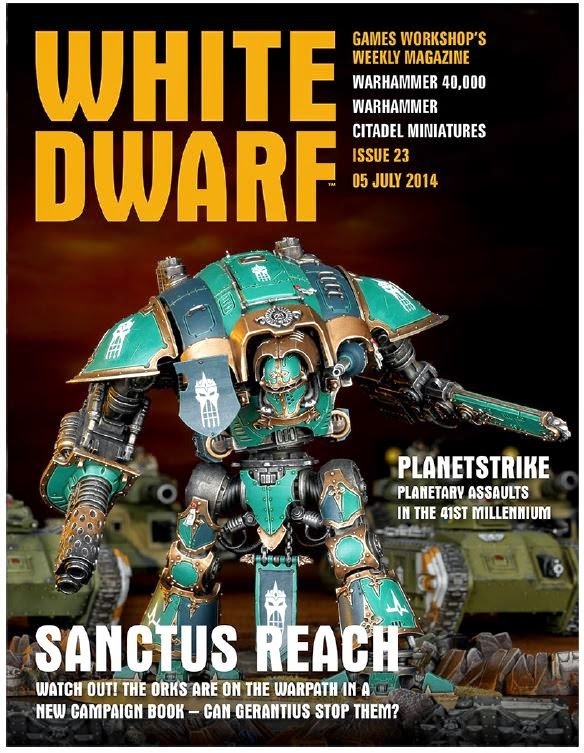 Another week and another White Dwarf. This time there aren't any major new releases, with the closest being the repackaging of the Dark Vengeance box. What's up everyone? So before I start this post, let me say that the Facing The Grey Tide Podcast is now up on iTunes (OH Yeah, We have made the Plunge). So please go rate, review, download, and subscribe because we will still be putting up the Podcast on the site, but we also want you all to have the ability to take us with you on your Apple Products. Now that the business side is done, let's get down with some ideas that have been bumping through my head. As you all know, I really only play two forces, Space Wolves and Iron Hands. Now the Wolves of Fenris are hoping to have their codex updated in the next couple of months (speculation because of the Storm Claw Box Set) and I have been thinking about the vehicles in their arsenal. Now all of the vehicles are the same as the Space Marines, but there are some differences that are making me wonder how to best use them; I am going over my favorites, and how I am thinking of using them in the near future. As I prepare for NOVA and waffle on what Tyranids to bring, I realized I won't really have any likely opportunities to play test any list I come up with. 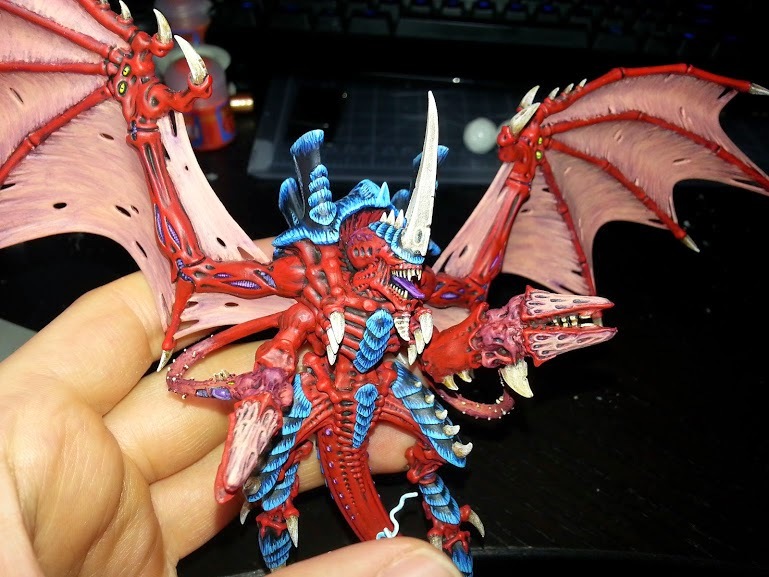 If you recall my original list, I was going a little out of the ordinary with Troops and trying out a Tyrannofex for the first time, as well as a combat flyrant and possibly a Haruspex. Considering the lack of play test time I decided to be more conservative with my list builds, as well as download VASSAL again and playtesting lists virtually. I wanted to spend a little bit of time talking about lists today. Lists are the magic word in 40k. When you lose to someone, it's probably their list. Have a tough time at the tables of a tourney, it's because you couldn't take your best list because of XYZ. The list is as integral to 40k as knowing the rules and being tactically sound on the table as well as a primary source of frustration between players when one person's list clearly is superior to another player's. I thought I would spend my weekly rant/update to you all by going over my list. I already have a bevy of excuses why it isn't better! 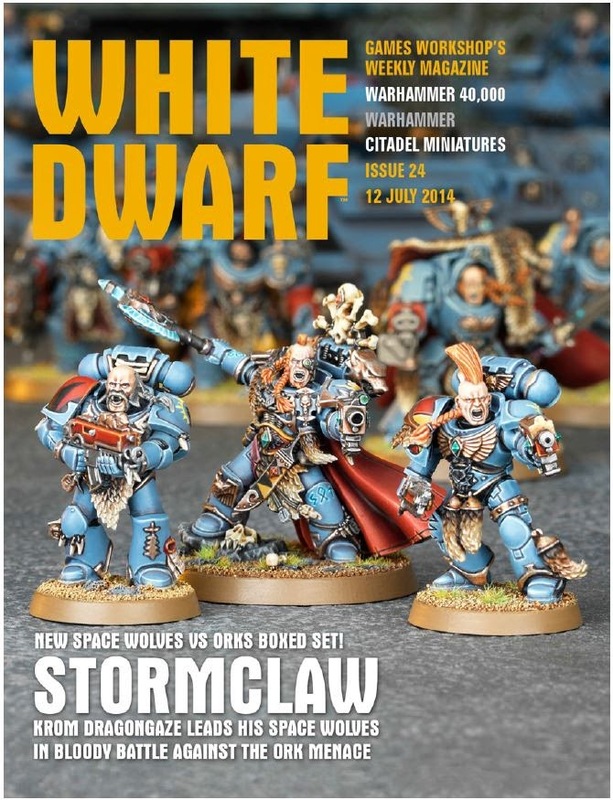 This week's White Dwarf features the new "starter" set for 40k, Stormclaw. 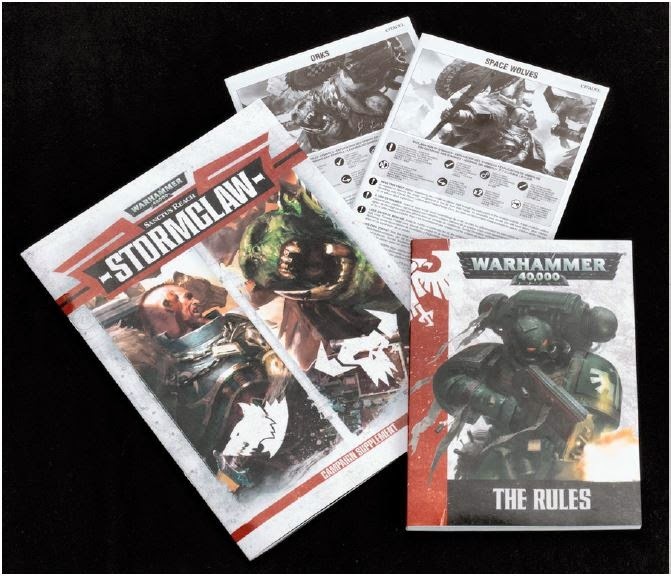 As has been leaked all over this week, the box features two new characters to lead the collected forces in the box, with Orks and Space Wolves facing off. While there are only two new models in the set, it still checks in as a great deal, with $175 of minis not counting the two new sculpts and the mini rulebook and campaign book. Ron here with my to-do painting list for NOVA. This series will hopefully help me conquer the grey tide I need to paint for NOVA, and provide you ample opportunities to ridicule my painting abilities! Ron here with another conversion quickie. Today we are modeling a thorax biomorph on a hive tyrant. Ok, it's a little later than most of our "First Looks," but with the holiday weekend and fantastic weather, I wasn't hanging out with my computer much. 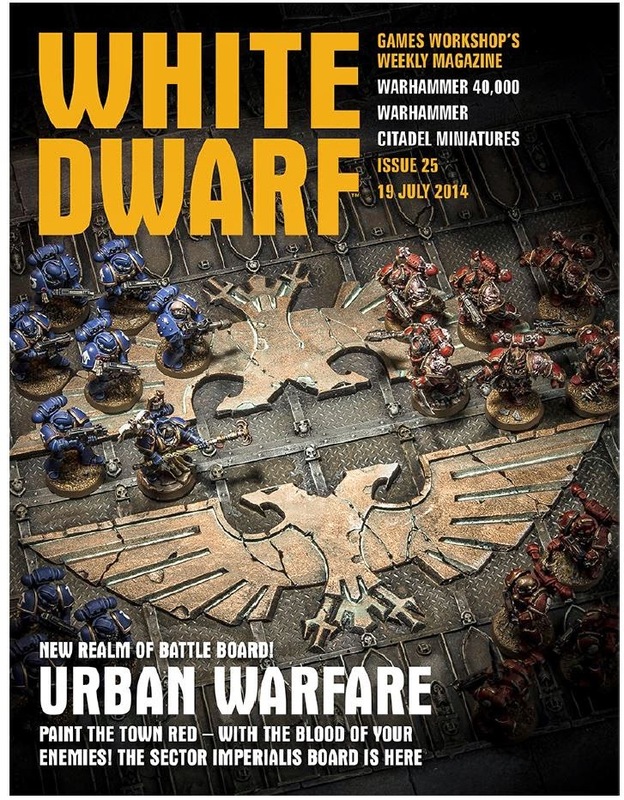 Anyway, let's take a look at the supplement about the most famous Ork Warboss of all. While we wait on Waaagh! 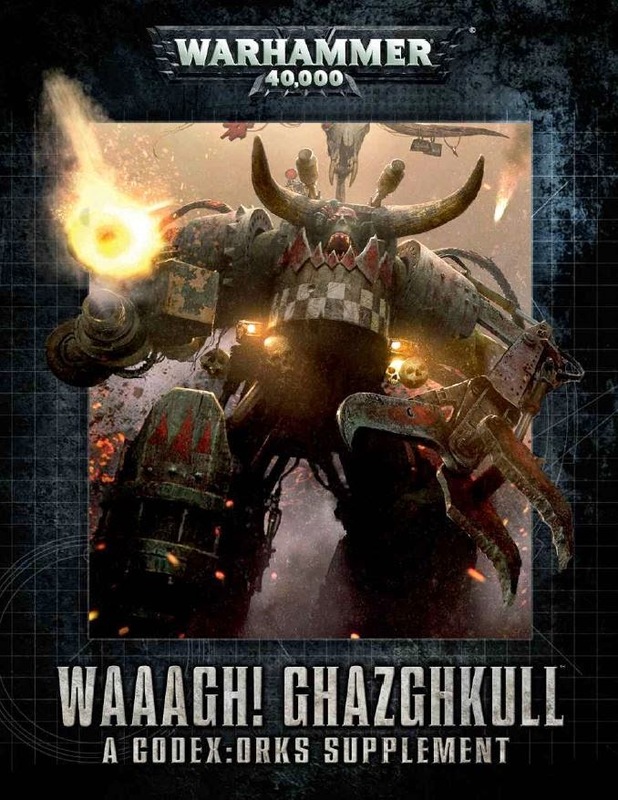 Ghazghkull to be available for download, we'll take a quick look at this week's White Dwarf, introducing the first installment of the Sanctus Reach Campaign - Red Waaagh!, which includes rules for Planetary Assault campaigns and games. The thirty strong termagant blob and you: How I came to loathe the Tervigon tax. Wow, it's been a long time since I've had a chance to talk to you. Real life has taken a turn for insanity this summer but things look to be slowing down a little bit more. 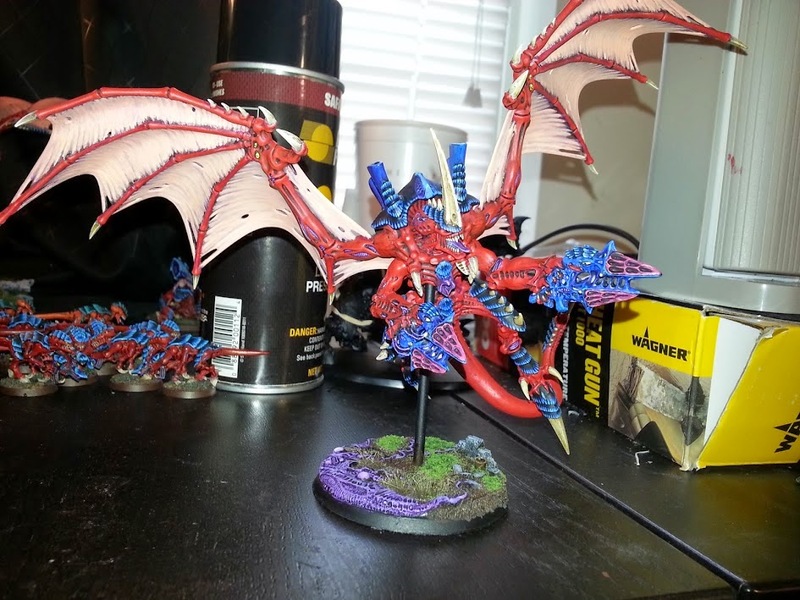 I wanted to talk about something that I have been struggling with as a Tyranid player and in talking to the other guys on this blog, I realized I'm not the only one. 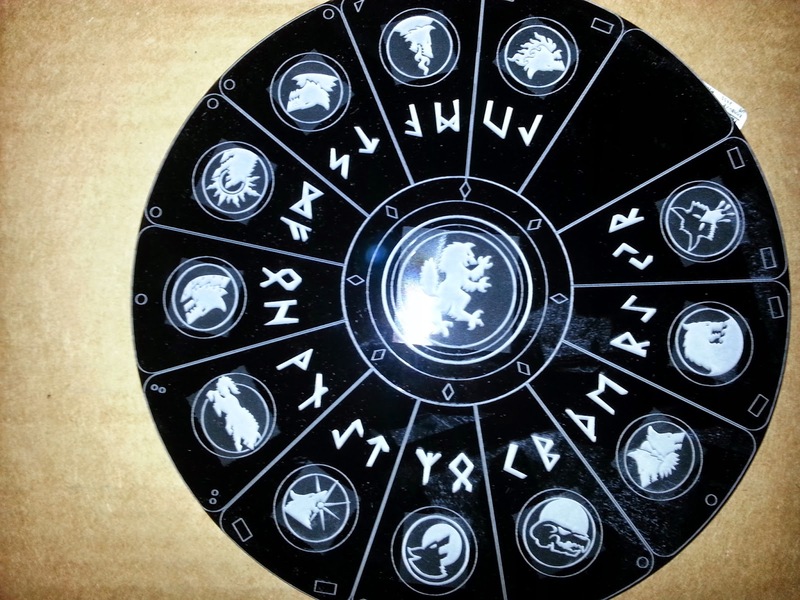 The question is, "How do I effectively use the thirty strong termagant brood required to unlock my Tervigon?" Hi, we're not just in units of 10 anymore. What's up everyone? This week on the Podcast Ron, Evan, and Chandler break down their weekend at SpikeyCon, how the Tournament went, the fun games we got to try out, and breaking down a couple of lists that Chandler was making for a fellow Space Wolf Buddy. The boys also break down their thoughts on The People's Missions made by the crew over at Forge the Narrative. We Love the missions and we talk about our thoughts and the armies that we went up against in the Iron Man Tournament. 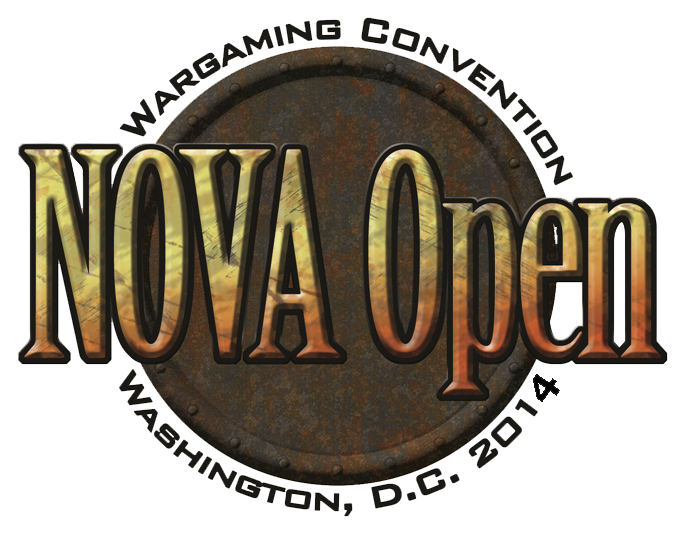 We can't wait to get to our next tournaments and send a Trio to NOVA. Flying Monstrous Creatures - What do we do with them? What's up everyone? 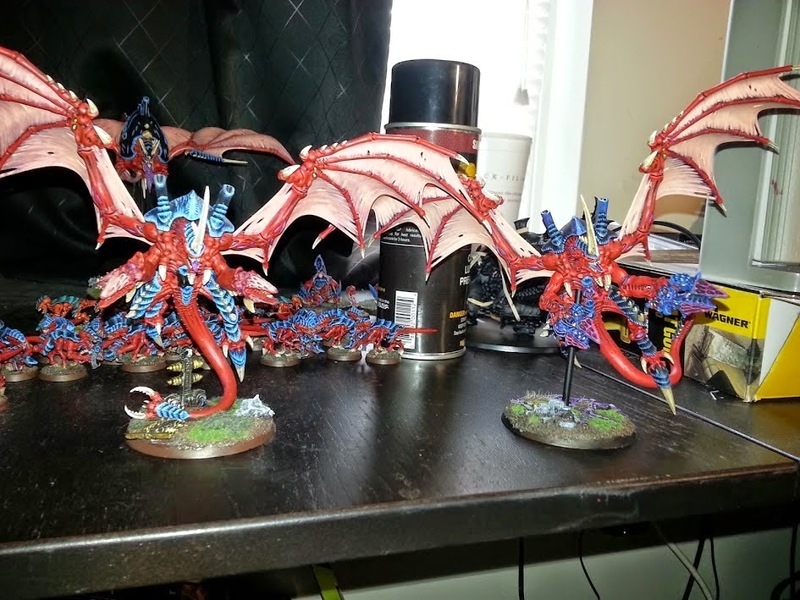 After thinking about my first 4 games of 7th Edition, what the prevailing armies are, and after Evan's post on some early tournament data, I realized that the Flying Monstrous Creatures have become one of the stronger aspects of the armies. Yet, they aren't invincible, they can be harmed, but what are the options for doing this? How do we attack them, try to ground them, and what can we do to bring the pain? Now most of the tactics for bringing down the FMCs will be relegated to the Nids, but I feel that the tactics can be applied to the Demons as well. Actual flyers though are still a different beast that can have similar tactics applied to but still need a bit of finesse.